There are many places besides garage sales to sell used items. If you think you can get more for an item or you think something has real value, try a used bookstore, consignment shop, Craigslist, eBay, or an antiques dealer first. If they sell there, you’ll get a higher price for them. If they can’t sell there, you’ll feel better about letting them go for cheap at your garage sale. 12. ADVERTISE BEFORE AND DURING! I cannot stress this enough. I know it was THE key to my success (I had one woman drive from an hour away to “pre-shop” my stuff and then come again on the day of the sale)! List your garage sale on Craigslist a few days in advance with as much detail as possible. (Other garage sale sites pull from CL so you don’t need to re-list it. You can, but it isn’t absolutely necessary). -Date and start time of sale (don’t bother posting an end-time—you’ll know when to shut it down). -As many photos as possible. You also need to advertise the day of your sale with neighborhood signs. Put up as many of these as your township or association will allow. Make them large, sturdy, and legible, and place them at prominent intersections as well as along the path to your house from those intersections. Put big-ticket items closer to the curb, so passing cars can see them. Like pretty window displays in a store, this draws people in. Group categories of like items together. Furniture goes in one spot, kids’ stuff in another. Think about how department stores are organized into zones. Make it easy to shop. For instance, have tables next to clothes bins for people to lay them out as they look through them. Give customers laundry baskets as they do their shopping. This is a classic retail trick: When their arms begin to fill up, hand them the basket and say, “Here, you can use this to help you carry your things.” They’ll feel like you’re being helpful (which you are!) and they’ll usually end up buying more. As things sell, rearrange. Fill in gaps on the driveway and knick-knack tables. You want your sale to look full so more people will stop their cars. This also really helps you look busy and active. If you’re just sitting in a lounge chair, it seems like all the action, and all the good stuff, is gone. This was my own personal motto, and I was ok with it because I reminded myself each time that my end-goal was getting rid of stuff. I decided in advance that, other than for my “non-negotiable” list, (and one obviously ridiculous early offer) I was going to say yes to any offer. I learned this lesson trying to sell a picnic basket at a friend’s garage sale a few years ago. I had it priced for $4 and a lady offered $2. I said no, and then sent it to charity at the end of the day. Did I really haggle over $2? That wouldn’t have even bought me a sandwich at McDonald’s! You can see what I mean about the value of money taking on new meaning in garage sale world. I was warned about this and blew it off. And someone stole every last piece of jewelry at my garage sale. Thankfully, none of it was valuable, and thankfully I did listen to the advice I read to keep my cash in a fanny pack (yes, swallow your pride and do it), so it wasn’t too much of a loss. I never thought I would do this, but I reluctantly let my kids run a lemonade stand at our sale (I’ve never liked being guilted out of my quarters by other people’s too-adorable offspring). But they really wanted to be involved. So they made a big sign with our puppy’s picture on it and sold cookies, brownies, and soda, and gave away free lemonade. I just made sure to warn people in my ad on Craigslist. I wrote “Fair warning: Cute kids will be selling cookies to raise money for their puppy adoption.” People were really sweet about it, and when the sun got hot, those sodas were lifesavers! And guess what? They made $50. I thought that was a shocking total! I’m now a big fan of kids’ lemonade stands. I was so busy the day of my sale, this never occurred to me. And I was burnt as a lobster afterwards. On a related note, make provisions ahead of time for your basic physical needs: Someone to take over so you can have a bathroom break, a ready-made sandwich for lunch, and a supply of bottled water close at hand. I had not anticipated the steady stream of customers and meeting those basic needs ended up adding even more chaos to the day. Have a Sharpie, extra price stickers and shopping bags within reach. Pretend you are a retail store and stock supplies accordingly. This is another retail trick: Greet your customers. Say hello to everyone (this helps them know who to ask questions of, who to pay, and that someone is watching in case they have thieving intent). I say, “Hi, welcome! Let me know if there’s anything in particular I can help you find.” And then leave them alone to browse. Remove sold items from your Craigslist post and update the date of your sale. (If it said Thursday/ Friday, just change it to Friday). This will make your sale feel fresh and new, and will avoid disappointing anyone coming on the second day who wanted an item that was already sold. I hope this list has been helpful! My final advice is this: Pray. It may feel silly, but it’s perfectly ok to pray about a garage sale. God cares about everything in your life, big and small. I invited Him to be at my house that day, to bless my efforts and to bless the people who would shop there. Posted on May 26, 2017 by Laura Irion and filed under Building Your Home and tagged organization. Warmer weather is finally here, and that means garage sales will start popping up soon. If you’re like me, you have a lot of items accumulating (like mountains of kids’ toys), and it would be great to earn a little cash for your efforts to see your playroom carpet again. A garage sale can be very rewarding. Last year I held my first garage sale. It was very busy with steady traffic and we made a good haul at the end. I did a ton of research beforehand, channeling my retail background to create my strategy, and I’ve compiled a list for you of things I learned from the process. 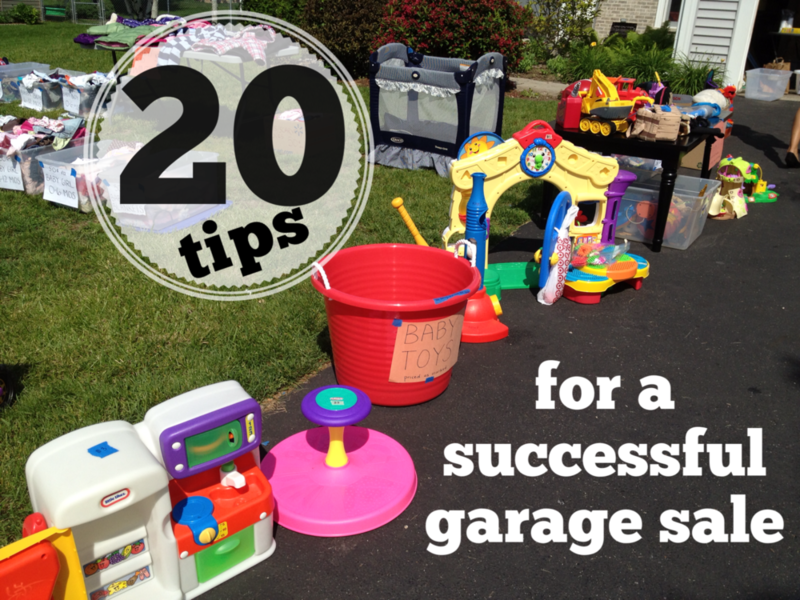 Before you even put these tips into practice, I want to prepare you that having a garage sale is not for the faint of heart. It takes way more sweat and work than you’d ever imagine, and sometimes there is little return for your investment of time and energy. You need to be prepared with the mindset that this is stuff you would otherwise be donating to charity. When the sale is over, plan to load up everything in your van and take it there immediately. Your goal should be to de-clutter and clean out, with any cash you get in the process being viewed as a bonus. In garage sale world, the value of a quarter suddenly becomes so elevated you can make yourself crazy. Take a deep breath and don’t let it. The reason we had a garage sale was because our kids wanted (ok, I wanted) a puppy. Having a cause to rally around helped involve everyone in the family. 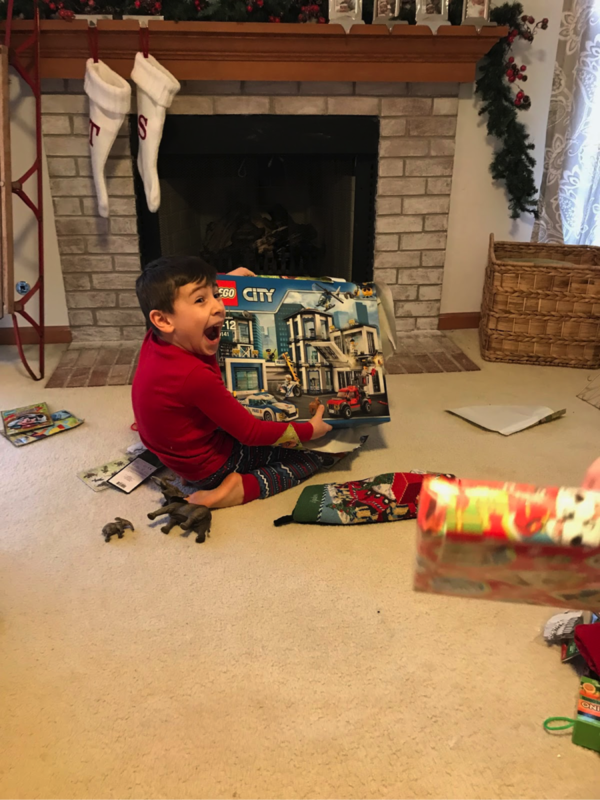 The kids were more willing to part with old toys because they knew the money would bring home “Dyson.” (Yes, we named him after the vacuum). They happily helped me sort, purge and price because they wanted something more than their old junk. Your family could decide beforehand what any money earned would go toward (Disney World?) and you’ll find it enjoyable to work toward a common goal. Once we decided what weekend to hold our sale, the kids and I passed out flyers to every home on the three streets surrounding ours. We let them know about our sale and invited them to have one the same weekend. Neighborhood sales have a much better turnout of traffic than individual sales. I gave my phone number and asked for a text if they were going to do it. I made it clear they were totally on their own, but that I would advertise. Four other homes said yes! And we did have a TON of traffic. If more than one family is selling items at your sale, you can advertise as “multi-family,” which will also help boost traffic. I had three friends drop off their items at mine, meaning I had more merchandise and variety to appeal to potential shoppers. Just be sure to agree with your friends beforehand about a method to keep income straight. Another bonus of this method is that you’ll have more people to “work” the sale because your friends will stick around. Hopefully! I remember when I took Betsy’s class, on “tips day” she said: “Only keep items in your house that are either beautiful, functional, or you just love them.” That stuck with me, and I have tried my best to live by it. (Read: NOT always successfully. Yet!) This is going to be a wonderful opportunity to de-clutter. Be committed to those three criteria, and you won’t have any regrets. When you go through your stuff, throw away anything with stains or holes. Don’t bother trying to sell it. It will make people mistrust everything you are selling if they see one item in unwearable condition. Wash or wipe down everything. Make it as clean as possible. Put as many items as you can in gallon size or XXL Ziploc bags. They feel new! 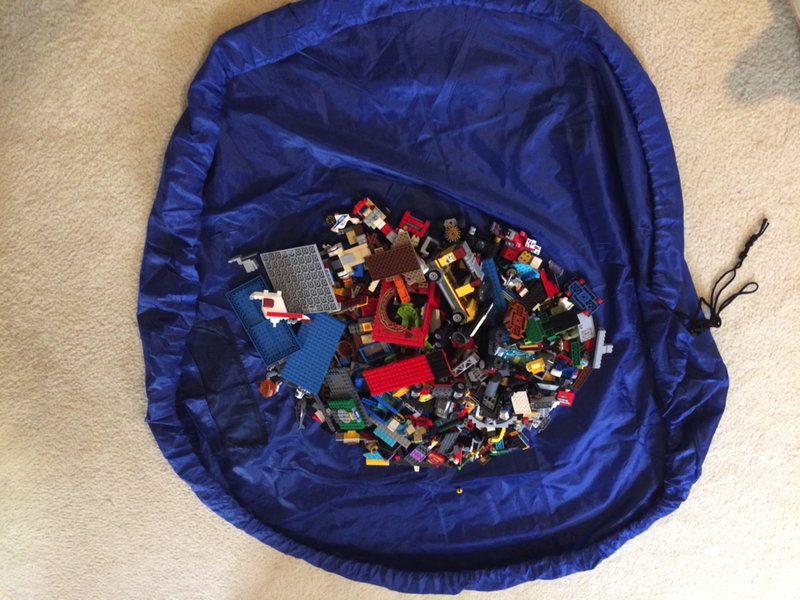 Bag like items together (for instance six Star Wars figures in a bag, or a baby outfit that includes hat and socks in the same bag). In your staging area, organize your merchandise by category (kids’ stuff, household items, adult clothes, furniture) so that you can set it up that way on the day of your sale. It will be easier for people to shop for what interests them, and they won’t get frustrated by digging through piles of unrelated items. In retail, “signing” (i.e. pricing things clearly) was directly related to sales. If a customer picks something up with no price, they will often leave without asking what it is. Clearly marked prices lead to more sales. If you would rather negotiate, put a sign on your table saying “no reasonable offer will be refused,” or “MAKE ME AN OFFER!!! !” (whichever your style). The price tag will help get the process started for your customers and help them feel comfortable. Feel free to discount items bought in bulk. For instance, “Treasure Toys 25 cents each or 6/$1,” or “Books 25 cents each or $5 for the whole bin.” This worked very well for me to clear out groups of items quickly. Personal Soapbox: Don’t overcharge. Nothing is more disheartening to me that to arrive at a garage sale full of great stuff and see they want $5 for a kids shirt or $10 for a pair of shoes. Those are consignment store prices. The garage sale is the last-ditch effort to get rid of stuff for a few coins before you throw it away, so price accordingly. Clothes (kids and adults) should be .50-$1 and shoes no more than $2-3 ($5 for unworn condition in a box). The good news is, when you price low, people will buy more. Remember, your goal is to get rid of your stuff. Of course there are some items that are too valuable to just give away or to let go for next to nothing. Decide in advance what those are, so you won’t have to make a gut-decision with a haggler that you might regret later. Posted on May 24, 2017 by Laura Irion and filed under Building Your Home and tagged organization. Embrace your system—Even if it's not an "A" System! Are you trying to be type A when you're not? I'm speaking to all my sisters out there who have the type A mom and the type A older sister that you are always striving to be like: Shift your lens to look at it as a blessing that God chose to put those awesome people in your life as your mom and sister... but then embrace who YOU are as wife, mom, and friend! I have those type A role models in my life but when Jesus made me He made me far different from type A. It's something I have struggled with my whole life—trying to match up to or try harder or just make myself be able to do all the things just like my mom and sister. The reality of that looked like a lot of failing on my part and systems that I couldn't make work. I will turn 40 this year and have finally come to the realization that whatever it is that I am "doing" it has been working for the last 15 years. We have 5 school age kids that love to play sports, need all the uniforms washed for school and sports, need lunches made, important papers found and special creams put on owies. My husband owns a business that has his phone ringing at 3 AM many a morning, or requires working months in a row at times, but he still manages to coach our boys in football. I work at the kids’ school as the K-6th grade art teacher and do hair on the side. We also squish in there serving at church. Why do I tell you ALL THESE THINGS? ... To say that life is daily. Super daily. All the things get done, children get fed in mouth and heart. The daily-ness of life and the running to and fro? They all happen. And guess what? I don't have a "system!" So if I can give you a piece of encouragement for your weary, free-spirited heart and creative hands as a mama, it would be to embrace who God has made you to be. I am far from a type A, organized person but I do have things in place that work for me and our family. Here are a few tips for those of you who don't have the gift of organization—from one artsy mama to another. Allow others to help you. My sister thinks it's super fun to organize a kitchen cupboard. I have gladly allowed her to use this gift in my home. And I have used my love of decorating to help her in her house. It's a win-win. Leave the cleaning chores that your kids can do till last. That way when they get home they can "help you" get all the things done. I usually write the chores on pieces of paper cut into strips and stuff them all in a bowl. Then I fill another bowl with silly, fun tasks for them to choose from. This way it makes "chore doing" a bit more fun and produces a lot less complaining! So take some time this week to look around at what has already been working for you and be encouraged! There may be be some areas that need tweaking or that you need to ask a friend or family member for help with, but that’s okay. Mamas! Stop comparing and start embracing who God has made you to be. Comparison is the death of gratitude. You are THE mom for the people He has given YOU. Embrace your system even if it's not an “A" system. Posted on January 18, 2017 by Heidi Wolf and filed under Building Your Home and tagged organization. 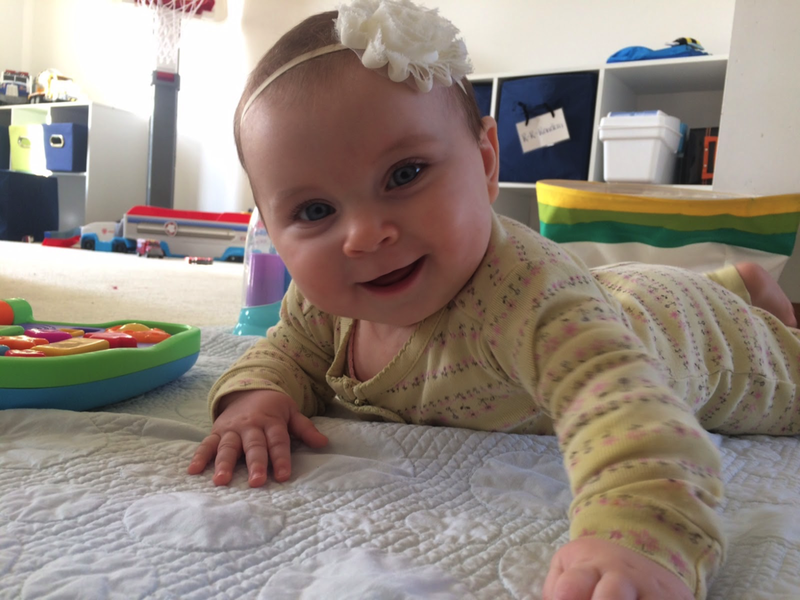 I took the Entrusted with a Child’s Heart study when my firstborn was one. Back then grocery shopping was a quaint way to introduce my son to new colors and vocabulary, not the three-ring circus it can be now. Meal planning seemed simpler and still somewhat exciting. It was so much easier to have my finger on the pulse of my home those days. Once upon a time, the encouragement toward orderly living (Chapter 5: A Godly Mother is Orderly), seemed like a pretty attainable goal. Betsy said, “I know I have my finger on the pulse of my home if I know how much milk is in the refrigerator. If I don’t I know I’ve been gone too much.” Only a few years and two boys since I’ve taken the study, and I realize I don’t have the level of dish soap memorized anymore. I wish I did. I stay pretty on track of the items we need, but it often requires me to check everything before each trip to the store. It is a waste.of.time. I’ve discovered an easier way, and I’d like to share this--and a couple more tips--with you. Go through your house and write down every product you regularly use. Write down hand soaps, paper towel, toilet paper, batteries, printer cartridges, etc… Pretty much everything consumable except groceries. Take the list and create a spreadsheet. I suggest putting the most commonly replaced items at the beginning of the list. Leave the bottom for items such as printer cartridges and duct tape. 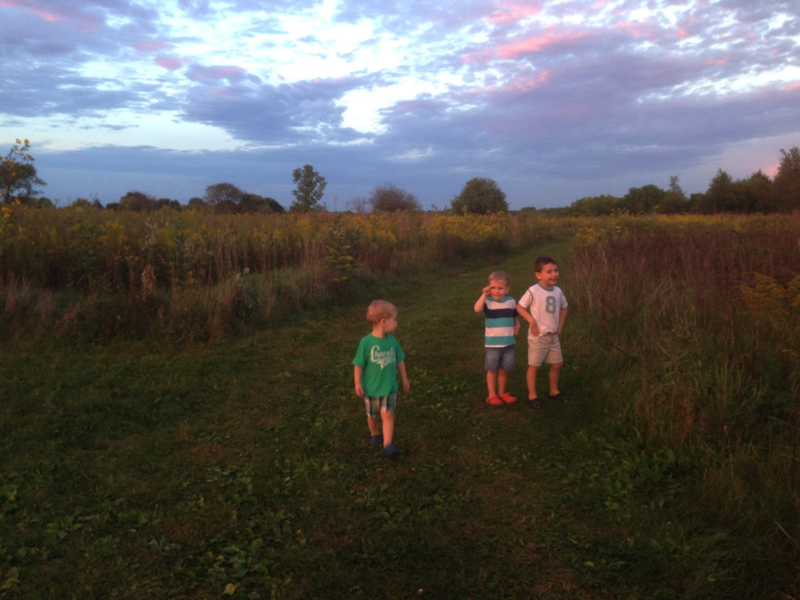 Being a stay-at-home mom, I find that I am the one who knows all the answers about my kids. 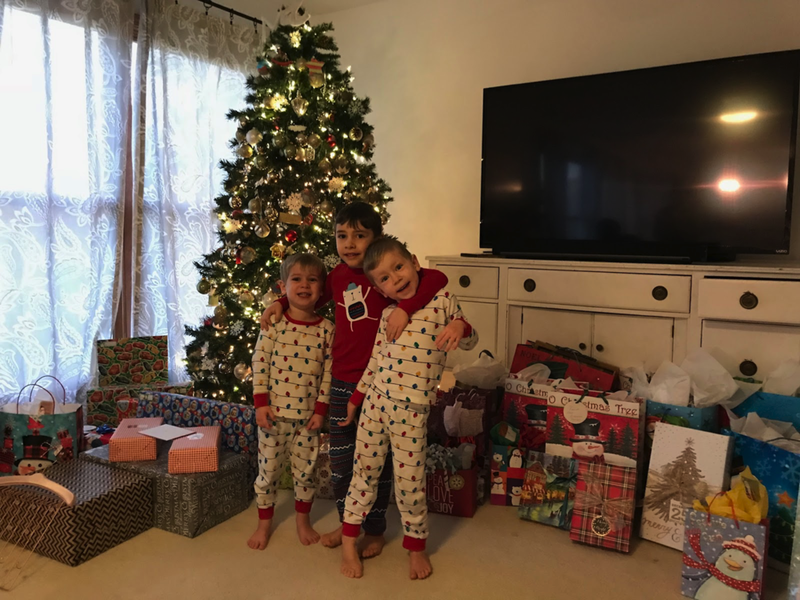 Because I am almost always with them, there isn’t a reason for my husband to need to know everything… However, there are times when I would rather have Travis pack the diaper bag for me than have him buy me flowers! In the past 4 ½ years, I can count on one hand the times I haven't needed a diaper bag when I've left the house with my kids. That’s a LOT of lugging and packing! Since we use cloth diapers, I can’t just always replace a few diapers and get back on the move. Maybe it’s just my house, but this little task seems to always come at the last minute. And since we are usually out and about on Saturdays, the bag has to be repacked for Sunday mornings--and we all know how peaceful that morning is for most families. ;-) Occasionally, Travis will offer to help, but his help is more of me yelling items for him to add while I’m brushing my teeth or combing my hair. I think it could be a much more peaceful process! How about placing a checklist above where the diaper bag is stored? It should list all the contents. Then you can ask your husband to refill it, and the only question you’ll have to field is the difference between diaper cream and lotion! Even when kids outgrow diapers they still need to leave the house with a few things in tow. You can adapt this list for each stage. Perhaps a “School Checklist” is better for your family. The above task could become even more simplified if you also created a “Car Bag.” In it place a seasonally-appropriate outfit for each of your children. Don’t pack one of your favorite outfits, because hopefully this bag will stay in the car for awhile. Pick something presentable that you won’t miss. When you are away from home and one of your children has a spill, accident, or unexpected water adventure, use the outfit. When you arrive home bring the bag back into the house, repack it, and take it back out to the car. Now the diaper bag only needs to have snacks, sippy cups, diapering supplies, a nursing cover, activities… Okay, it may still be full, but your time packing it will be shortened! Just set another reminder in your online calendar or planner to switch the outfits when the weather changes. 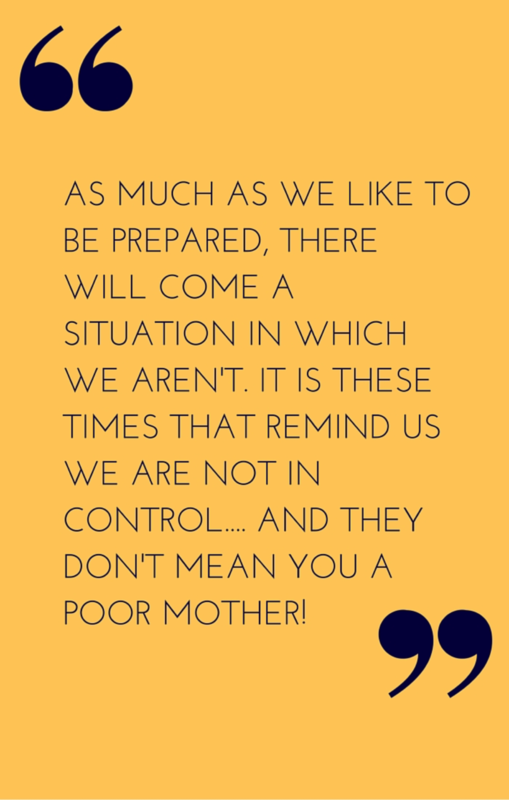 As much as we moms like to be prepared (to be honest I’ve had to check myself from being prideful about it) there will come a situation in which we are unprepared. In it we recognize we are not in control. These moments happen to everyone, and they don’t make you a bad mother! Just roll with it, ask the Spirit for guidance, and hopefully you’ll get a good laugh out of it later! I’ll leave you with one of my most memorable “unprepared moments.” When my third son was a few months old, we decided to drive about an hour away to visit a barn sale my cousin was having. I had just found a great pair of white capris at a thrift store. Excited to wear them, I calculated the risk and decided it was worth it. Instead of packing just a change of clothes for each of my three boys, I also placed a pair of jeans in the diaper bag. When we arrived at the sale, my baby needed to nurse. He was in the middle of his nursing session when I felt--and heard--his little bottom go to town. My mouth dropped open, and I pulled back the nursing cover to discover my new white pants…. perfectly intact. Not a spot on them. However, my shirt and undershirt were SOAKED! Ugh! I had to ride home on that hot summer day with my shirt covered in that less-than-lovely smell. Oh motherhood, you sure keep me humbled and laughing! Posted on January 20, 2016 by Stephanie Hickox and filed under Building Your Home and tagged organization.